Visiting Mont Orgueil Castle is definitely essential! Beautiful, dominant and iconic, the Castle is dear to all islanders least of all for its role in protecting them from invasions from the very neighbouring French. Nowadays the relationship is friendly but one can imagine from the sheer size of the castle that it certainly wasn’t always the case. Long after military and political peace was established, historians started their own fight to know how best to restore the castle. Luckily that also ended up well and one can now enjoy an instructive and thoroughly safe visit. One of two castles in Jersey, Mont Orgueil started life in the 10th century as a Norman enclosure, over time becoming a Tudor citadel. Many words have been used to describe its use and appearance, ranging from fortress to jewel. The castle will appear as a fortress as you approach its impressive arch doors and accompanying drawbridge. Take time to look on the walls either sides as you enter, reading a little bit about the history along the way and about which exhibitions, activities or events are currently featured at the castle. Pass the ticket entrance before you reach the second impressive set of doors and drawbridge and, once inside, stop and look: you will be granted your first inside view of the castle. As the site is built on a rocky outcrop protected on three sides by the sea this first view will give you a strong feeling of safety and enclosure,the main raison d’être of the structure. From here, the beautiful grounds open up with well kept garden areas and a steep stair case leading you to the next door known as the Queen’s Gate. From now on it is probably best just to let your imagination run as you explore freely. The main pleasure at Mont Orgueil Castle lies in the fact that you are truly free to roam the site as you wish. However don’t miss having a look at the Dance of Death, paying a visit to the Witches in Hell, finding out about the Prayer Nuts, seeing the unusual Wheel of Urine and looking at the list of soldiers garrisoned at the Castle in the 15th century. All will become clear as you explore and discover, or you can take a free tour of the castle with a Jersey Heritage Guide on Tuesday and Thursday mornings. The islanders’ link to Mont Orgueil, also known locally as Gorey Castle, goes beyond its historical past. Many events are staged here, from Shakespearian plays to Halloween parties and the site can be hired as a fabulous venue for weddings and corporate days. Many families will spend a fun afternoon with children dressed as knights and princesses making it one of the most popular attractions in Jersey. The castle’s surroundings are equally appealing with Gorey harbour at its feet, a pretty pier and village where cafes, bars and restaurants are ready to welcome you at any time of day or evening. 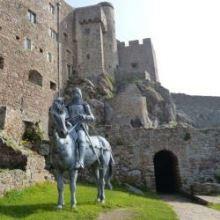 This entry was posted in Places to Visit and tagged Mont Orgueil. Bookmark the permalink.